Mike Larson writes at Money & Markets about the cause of the oil price decline. Bottom line: I wouldn’t panic if I were holding U.S. energy stocks. This multi-year trend toward increased American energy independence isn’t going away. Oil already has risen $2.5 off the lows. Do you really think any investment is going to enter Iraq? Do you think the ISIS will attack the oil fields of their foes? Do you think instability or stability will grow in the Middle East? My bet is on INSTABILITY! Do you think this will be good for economic growth? During the past couple months several indexes, sectors and commodities have sold off more than 10 – 20%. But now some are looking like new buying opportunities. Over the next week I will bring a few of these trades to your attention as they start to unfold. 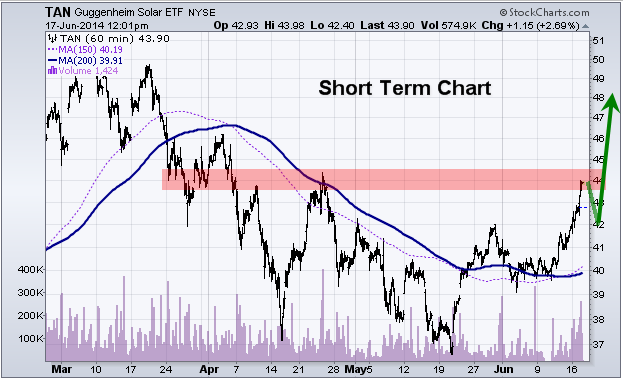 Today we are looking at the TAN solar energy ETF. This sector recently had a 23% hair cut in price. A 20-25% correction in price is a typical intermediate correction for a fast moving sector. The price correction has pulled the sector down to its 150 and 200 simple day moving averages. These levels tend to act as long term support for investors, a buying point. Many of the individual stocks within this sector are starting to pop and breakout of bullish price patterns. These individual stock prices point to higher prices for TAN going forward. Be aware of crude oil…. 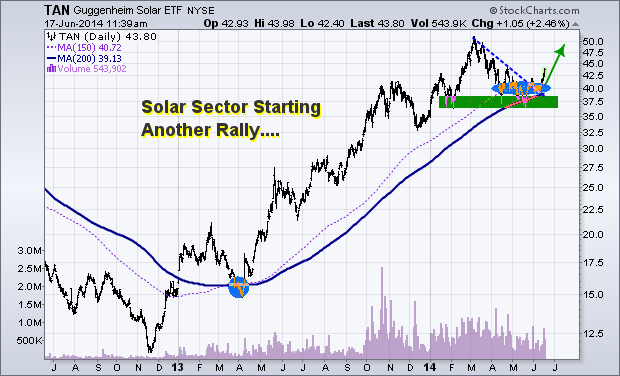 I do think that as long as the price of crude oil stays up solar stocks will continue to rise overall. But if oil starts to roll over and break down, TAN will struggle. Big picture analysis shows a powerful uptrend with bullish consolidation. Intermediate analysis shows a falling bullish wedge, test of moving averages, and a reversal breakout pattern. Short term analysis shows we are at a resistance level and we will likely see a pause of pullback over the next few days before it goes higher. If price closed back below the $39.00 I would consider this bounce/rally failed. Disclaimer: I do not own shares of TAN as this point, but may buy some in the near future. Solar power is booming! Spurred by a 60% drop in solar panel costs in the last 2 ½ years, robust government subsidies and a technology that no longer appears experimental to mainstream America, rooftop photovoltaic solar is bursting out everywhere. About 200,000 U.S. homes and businesses added rooftop solar in the past two years alone – about 3 gigawatts of power and enough to replace four or five conventionally-sized coal plants. The U.S. is now generating via solar panels almost 10 gigawatts each year. That’s enough to power 1.5 million average American homes; that’s the equivalent of removing 1.9 million cars from the road; that’s like planting 236,000,000 trees. Yet solar power provides less than 1 percent of the nation’s energy needs. Even in Oregon! Though our state has a reputation for clouds and rain, western Oregon actually receives as much solar energy as the national average. During a year’s time, an Oregon solar system will produce as much energy as the same system installed in Florida. PGE says that solar systems generally cost $4.50 to $6 per watt. Home solar system sizes vary, but most are 1,000 watts to 4,000 watts (1 kW to 4 kW). As an example, a 2,000-watt (2 kW) solar system would cost about $9,000 to $12,000. There are two ways to offset the cost. The first option is Net Metering Billing which lets you offset the cost of the electricity you use from your local utility with the energy you generate. The second is the Solar Payment Option. Your utility pays you for the power you generate up to the amount of electricity you use. Some utilities are changing the rules. They want to charge a fee for using the Net Metering Billing method. They are experiencing a decline in revenue that is threatening their ratings. Expect more organizations like Green Tea, a pro-solar group in Georgia consisting of Sierra Club members and Tea Party founders, to fight for consumers’ rights. If you would like to investigate solar power for your home, why not click the right-sidebar HomeSolar101 banner for a free quote? China makes deal for Canada’s oil that should be flowing down the Keystone Pipeline to the Gulf. Did You Cast The Wrong Vote In 2008? Try not to vote illogically again!